CBC honored donors, left to right: Susan Leugers, Teri Hunley of Englewood, Judy LaMusga, Glenn Stoops, Wendell Clark, Theodore Hale, Katie Ellis, Kelly Schmitmeyer, Bert Jones. DAYTON — Community Blood Center officially kicked-off the first state-wide celebration of January Ohio Blood Donor Awareness Month Friday, Jan. 4 with a call for more people to join a new generation of blood donors in 2019 and beyond. CBC Chief Operating Officer Jodi Minneman thanked Rep. Steve Huffman of Miami County, an ER physician and lifetime blood donor, for sponsoring House Bill 252 to declare January “Blood Donor Awareness Month.” CBC gave proponent testimony before the House and Senate Health Committees and the bill was signed into law on Feb. 8, 2018. Minneman also announced CBC’s top strategic goal for 2019 of identifying and recruiting more platelet and plasma donors. These blood components are critical for the care of trauma patients, cancer patients, transplant, and burn patients. 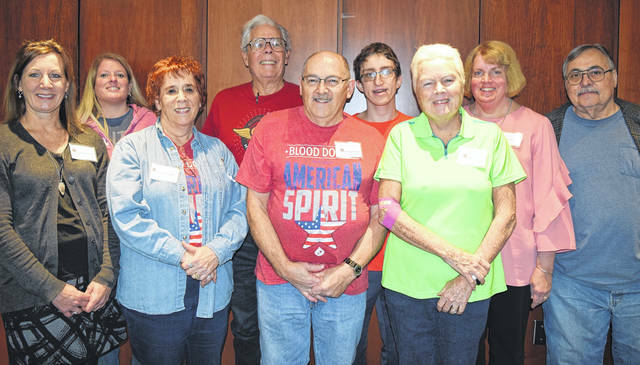 She emphasized the need for a new generation of donors to take the place of lifetime donors who are approaching an age when they many no longer be able to donate and might eventually need blood. Kelly Schmitmeyer from Anna – (Kelly was scheduled to make her 44th lifetime donation the day she suffered a pulmonary embolism that nearly claimed her life. She received eight blood and platelet transfusions and was resuscitated several times. Kelly can no longer donate but her entire family now donates in her honor). Community Blood Center/Community Tissue Services® is an independent, not-for-profit organization. For more information about Community Blood Center/Community Tissue Services®, visit www.givingblood.org.